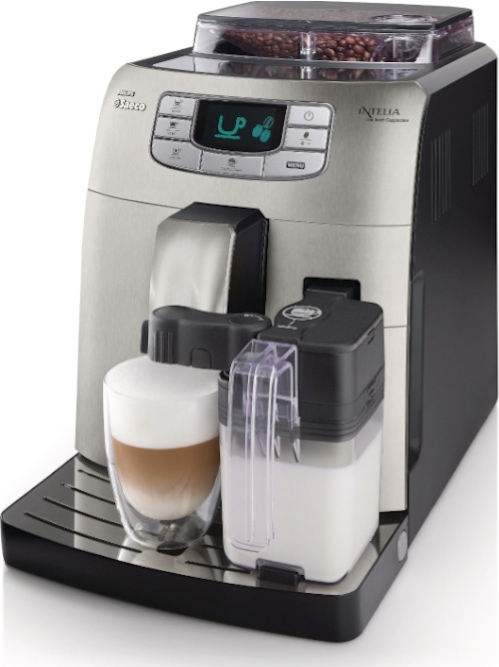 Top of the Line, High-End Superautomatic Espresso Machines Worth Buying Which Milk Is Best To Use For Cappuccino Froth? Philips Saeco Syntia vs. Intelia Super Automatic Espresso Machines: What’s The Difference Between Them? Philips Saeco definitely has a wonderful collection of super automatic espresso machines, and these two are no exception. The Saeco Syntia and Saeco Intelia are, upon first sight, very similar, but not really. There’s a number of differences between the two machines in which we’ll be discussing in this post. 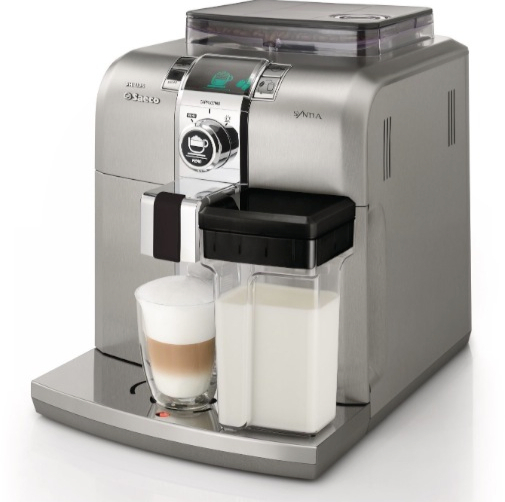 Super automatic with built-in grinder and integrated milk frothing system. Ceramic grinder that doesn’t rust and preserves as much of the coffee taste as possible. Ability to adjust and reprogram all settings. Choose from different grind options. Ability to save customized drinks. Adjustable coffee spout to avoid splashing and heat loss. Auto clean and descaling options. Click here to learn more about the Saeco Syntia, read the customer reviews and buy it. Fully super automatic espresso machine with built-in ceramic grinder. Quick heat stainless steel boiler. Reprogrammable and adjustable pre-sets and coffee grind options. Save your coffee customization options. 300 g coffee bean hopper. Click here to learn more about the Saeco Intelia, read the customer reviews and buy it. The Intelia has 1900W of power while the Syntia has 1400W. The Intelia has a bigger bean hopper of 300g and 1.5 Liter water tank vs. Syntia’s which has a 250g bean hopper and a 1.2 L tank. When it comes to operation, the Intelia has a number of buttons while the Syntia uses a combination of a knob and buttons. Which is better? I’d say that is totally up to you and what you prefer. While there’s a slight difference between the two machines, it’s not entirely overwhelming. If you’re on a strict budget, the Syntia could be your machine of choice as it’s a bit less priced than the Intelia. Otherwise, you can go for the Intelia for its more power and generous bean hopper and water tank which should save you some re-filling trips. Some information has been sourced from Philips Saeco website.